Nexus 5 has a significant rumor issues as the device awaits to be announced, past detail showed that Nexus 5 in black and now in white. For an unannounced phone, the Nexus 5 cannot seem to keep itself hidden at all. 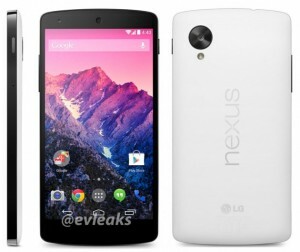 The following source @evleaks leaked the Nexus 5 in black, but has not shown it off in white. As the rumors continue to heat up, there is no question at this point that the phone exists but the question of when Google will finally move up and make an official announcement. Different rumors are pointing towards different dates over the next few days or weeks. It’s impossible to believe that device will not be announced soon, because the holiday season approaching very fast.